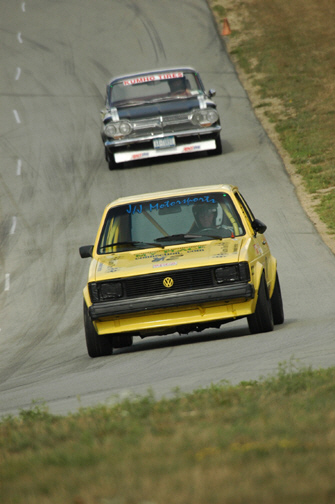 NECC Motorsports began life way back in 1974 for the sole purpose of conducting time trials for Corvairs at Lime Rock. NECC has hosted time trials, drag racing, and autocross events at several of the annual conventions held by the Corvair Society of America, including conventions at Jacksonville, Detroit, Buffalo, Portland, Lexington, and Chicago. Over the years, we've branched out, but we continue to enjoy the patronage of a loyal band of Corvair performance driving enthusiasts, and we thrive on their support! In 2012, NECC planned and conducted the 2012 Corvair Society of America (CORSA) International Convention, which was held in Sturbridge, Massachusetts. Corvair Preparation - So, You Want to Drive a Corvair with NECC? Corvair Classes - NECC rulebooks for Corvair classification system, etc. IS Calculator - An online tool for determining your Corvair's class (IS versus SM). Merchandise - Purchase dash plaques, posters, and jackets. Corvair Links - Links to other CORSA and other Corvair-centric websites. Corvair Racing Team Jackets Now Available! Attractive high-quality Corvair Racing Team jackets are available from John Lanning at Derby City Corvair! Visit our Merchandise web page for photos and order form!